The most beautiful moments in the life of a travel blogger happen when the schizophrenic virtual life that you lead half of the time on social media intersects with the real world. I had the pleasure of this wonderful coincidence on my recent visit to the Bay Area. I had to come here for work for a little over a week and, when planning where best to spend the two weekends, I started chatting online with social media guru and all-round fantastic Twitter super-user Scott. Scott has over a million followers on Twitter, all grown organically, and is a pretty avid tech, travel, food & wine lover. Living in Bangkok and always posting witty and interesting thoughts, we had been following each other for a while so, when I saw him posting photos of Napa I had to ask for recommendations. As expected, he jumped right on to help. From then on, we arranged to meet up on my trip and this is how I ended up spending a day in Napa with Scott and his great group of friends, lovely Karen as much a foodie as I am, Thai DJ Jeera and wine connoisseur and lover, Jason, who introduced me to the world of “By appointment only” wineries in the Valley. In the recent years I have shifted from all-planned vacations with to-do lists, must-see itineraries and full-on research to spontaneous live-in-the-moment, last-minute decisions and this was a clear example of that. It was not until Saturday morning that I decided what I was doing. On Saturday. 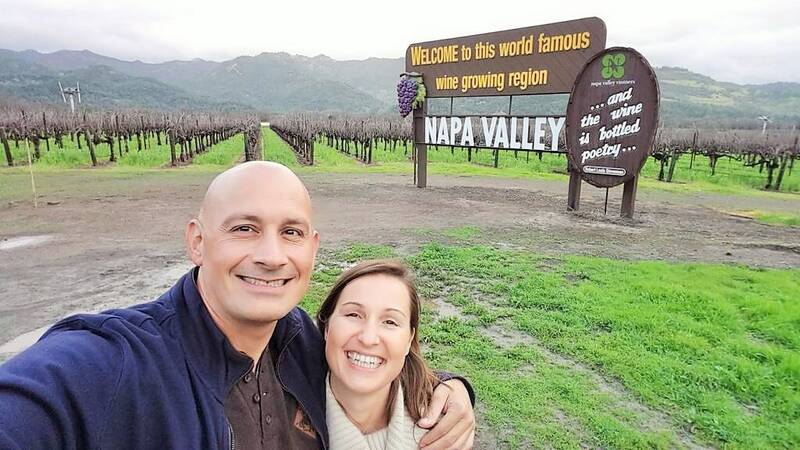 Armed with an insatiable hunger for good wine and food and only a couple of hours away from California’s cool city I set off to explore the Napa Valley, one of the great wine regions in the US. I figured that if I typed “Best wineries in Napa” on Google I would get just that and magic would do the rest so I started with the easiest on the list. Saturday went off pretty well with siesta stops required in between wineries to let my body digest the wine. I visited some petty nice properties, did some wonderful tastings, chatted with some true wine lovers and generally enjoyed the fantastic atmosphere of the area. Nothing beats a group of strangers sharing a glass of wine. Sunday was a completely different story. I had arranged to meet Scott and company at the first winery on their list. Little did I know that I was in for a treat. We visited three wineries all of which only take tastings and visits by appointment. Needless to say, wino fanatic Jason had everything organized to the detail and even took care of the driving so we could all enjoy the wines, bottomless. What a blissful day. I meet everyone at Chateau Montelena. Located on top of a hill at the end of a windy short road that snakes through moldy and moss-covered trees the property is fairy-tale like and I am expecting an elf to pop out anytime. Instead, I park my car and walk up to the main entrance. Two young guys stand by the door, ready to welcome me in as if they were bouncers of a club. Scott is already on his way out to meet me. We dive inside through narrow corridors lined with wood and hard stone toward an open room with a long wooden table and a bar. Everyone’s standing by the bar sampling some wines. The room is bright despite only having a tiny window, and I truly feel like I’ve been transported to a French castle in the Loire Valley. The place strongly reminds me of a winter day back home, at my dad’s house, thick stone walls of over a meter protecting the inside from the harsh outside conditions, be it the summer heat or the cutting winter wind. 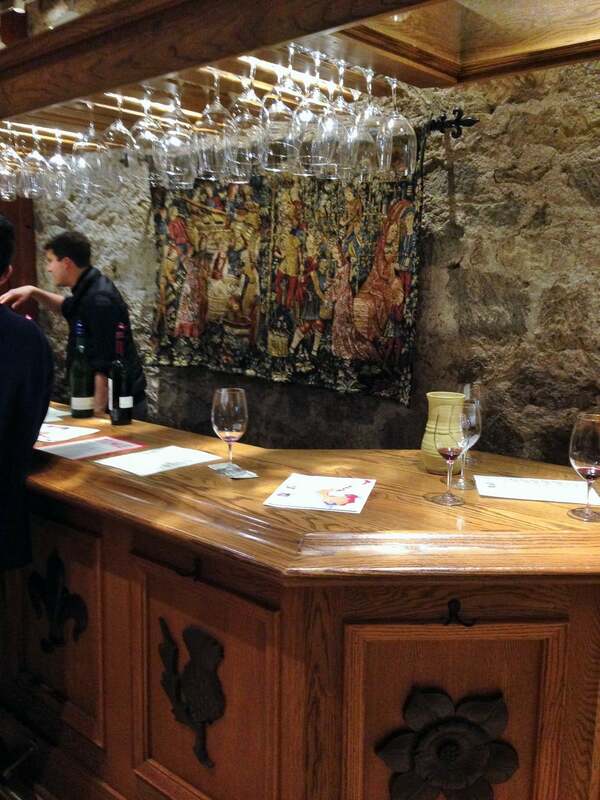 An intricate tapestry hangs behind the bar taking me back to Medieval times. It is as if the table, although not round, could be that of King Arthur. 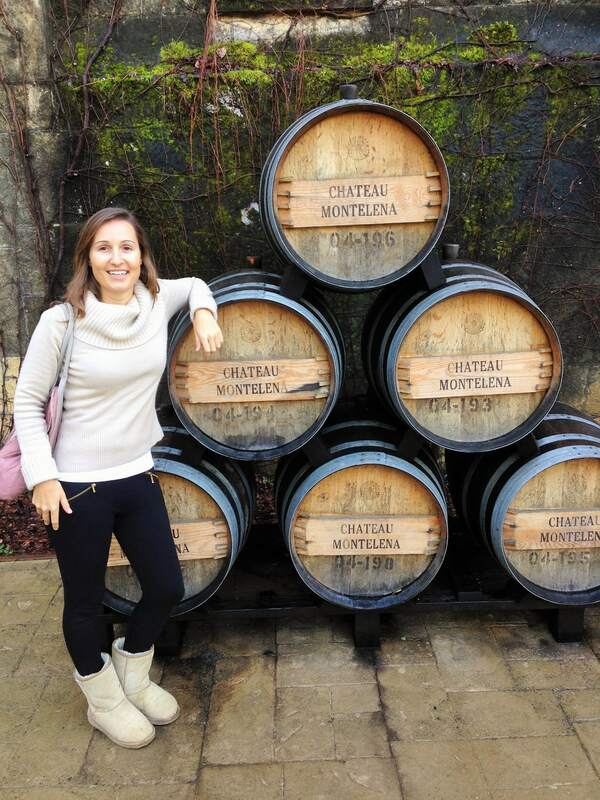 Chateau Montelena is famous because it was the first winery from the Napa area to ever be included in a blind tasting in France and to then go on to win against the French Burgundies. It’s Chardonnay is credited with being the wine which put Napa on the map and confirmed its coming of age. We taste a few of their wines, including the famous Chardonnay from the winning range and I must say they are all very rounded, balanced and beautiful wines. The staff is attentive and we are of course in Jason’s hands with all the commentary of someone who has been there before and knows the winery as if it was his own. The Cabernet Sauvignon we taste is delicious, sweet to the smell but perfectly light and easy to drink to the taste, I could have the whole bottle while watching the rain fall on this wintery day. It is the Zinfandel, a variety I am not very familiar with, that surprises me. I did not know what to expect but it was a fantastically sophisticated yet uncomplicated. I look around me and I can see the history the walls and floors exude. 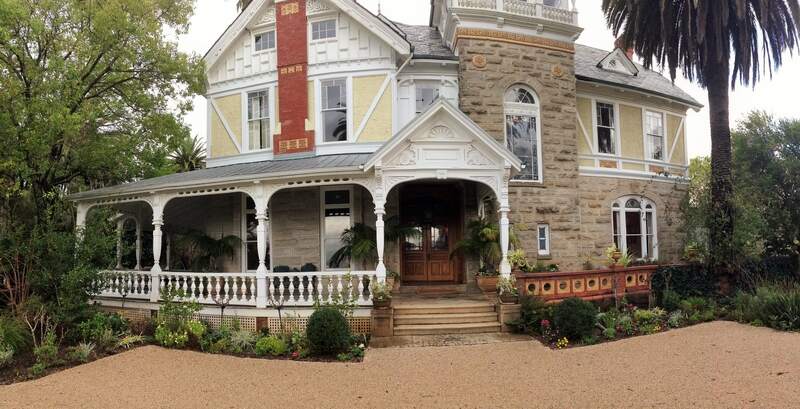 This is not a property built to resemble a historical Chateau, this is a real chateau built at the end of the 19th century by a San Francisco entrepreneur with a dream to produce wines in the Napa Valley. Although the winery dwindled in success and was negatively affected by the Prohibition era the tradition continued. It was in the late 50s when it was sold to the present day owners who turned it around to be the most famous Napa winery. 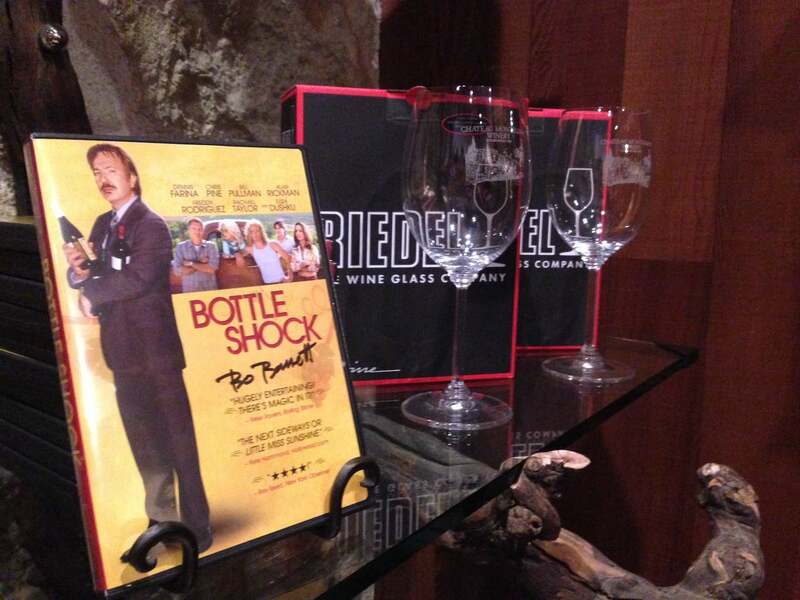 Not only is Chateau Montelena famous for its award-winning wine but also because it was the set of a movie, Bottle Shock, which showcases the Paris bind-tasting. Ask the staff about the story for a dose of nostalgia. 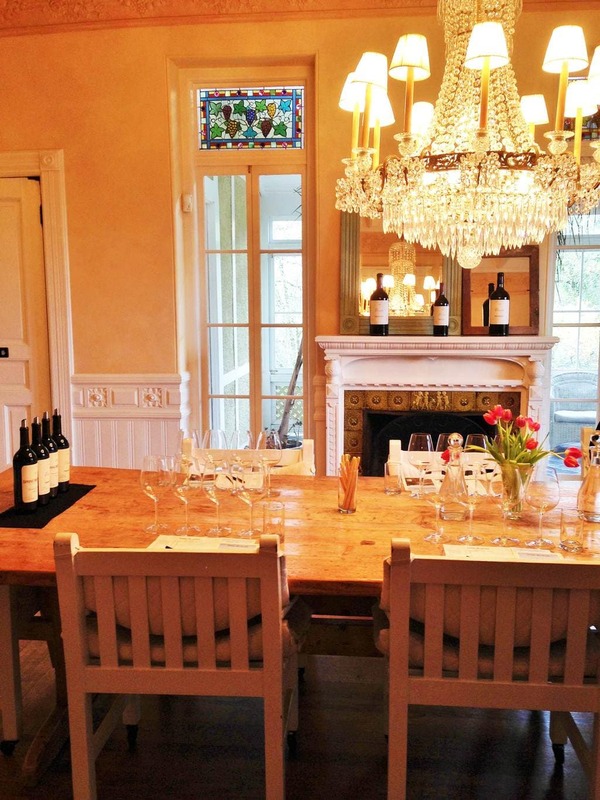 Chateau Montelena is available for tastings without reservation but for that extra intimate experience book in advance for one of their Limited Release tastings. $50 offered twice daily at 11,30am and 1,30pm. The winery also offers other specialized tastings and visits combining a theatrical explanation of the Paris events and even estate tours. 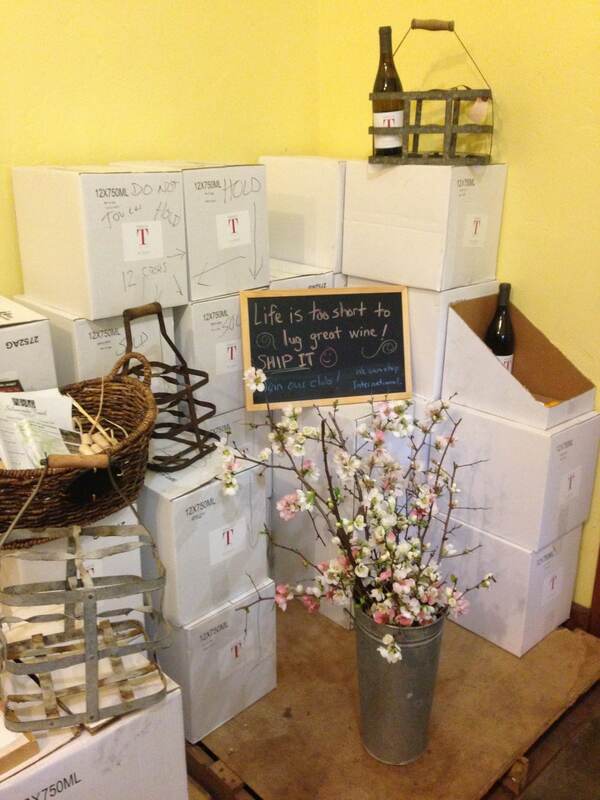 Tedeschi winery is hidden in a small lane in a residential area and you’d be forgiven for missing out on it. But make an effort, use Google maps and you will discover a little gem. All family owned and ran the winery is a cozy visit to a friend’s place. They produce only 1,200 cases a year, about 7,000 bottles, so it is a very niche winery. Visits are by appointment only but don’t be shy, call them up and let the family’s sons welcome you into their world. 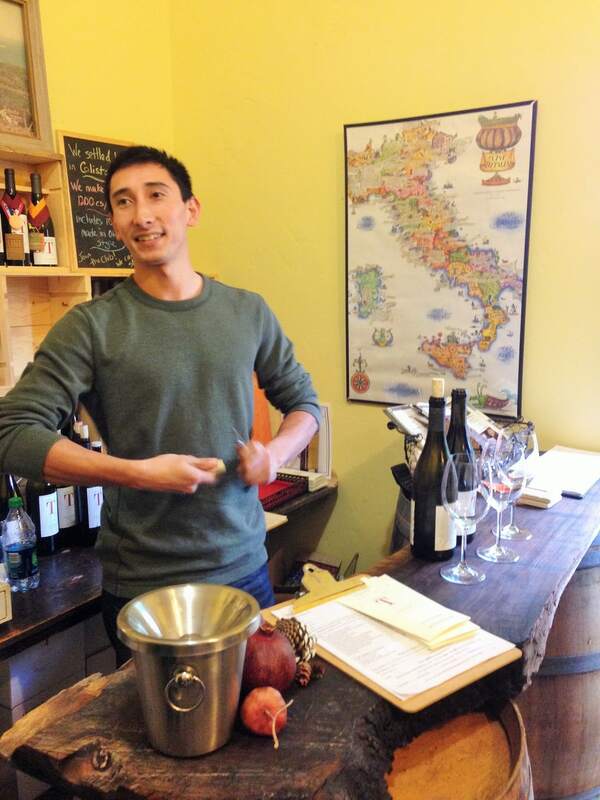 From the moment we walk into the tiny tasting room I feel like we are in someone’s home. The walls are lined with customer orders, their names on the cases, as if they were old friends and the shelves filled with medals and other wine memorabilia. The family’s marble coasters lay on the counter, beautifully arranged. The love and passion of the Tedeschi family can be felt. This is not a business created to make money, this is the labor of love. The son of the owner moved to Hawaii and opened a Tedeschi winery there too but then returned to Napa to continue the family’s tradition. The marketing materials and cute board messages spread across the room are friendly, sweet even, and familiar, unashamedly warm and unapologetically neighborly like. The walls have a colorful map of Italy reminiscent of the family’s heritage. 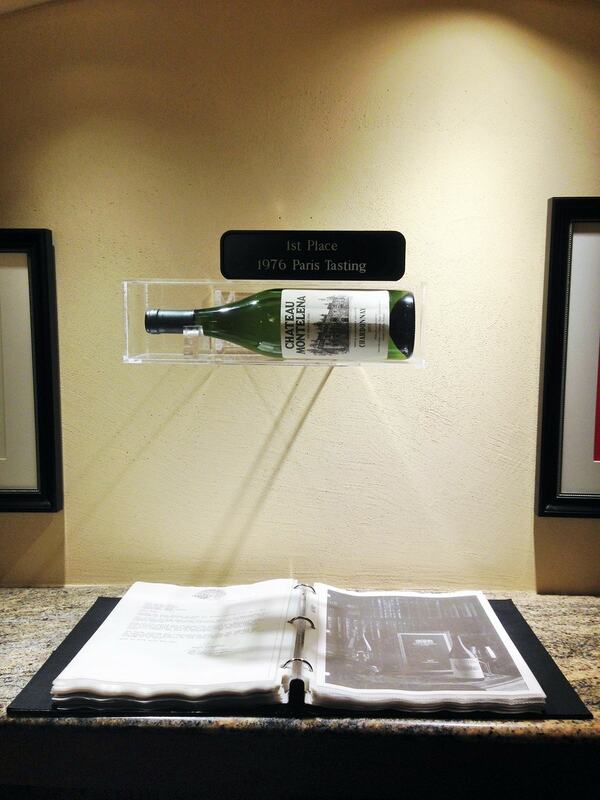 The winery’s wine selection is small, as is the property, allowing the team to focus their efforts. The grapes are handpicked and the quantities are small enough for every barrel to be tested several times. We taste the Chardonnay and the Pinot Noir. They are both excellent wines and for the price point (below the $50 mark), they make for excellent accompaniment to any meal. 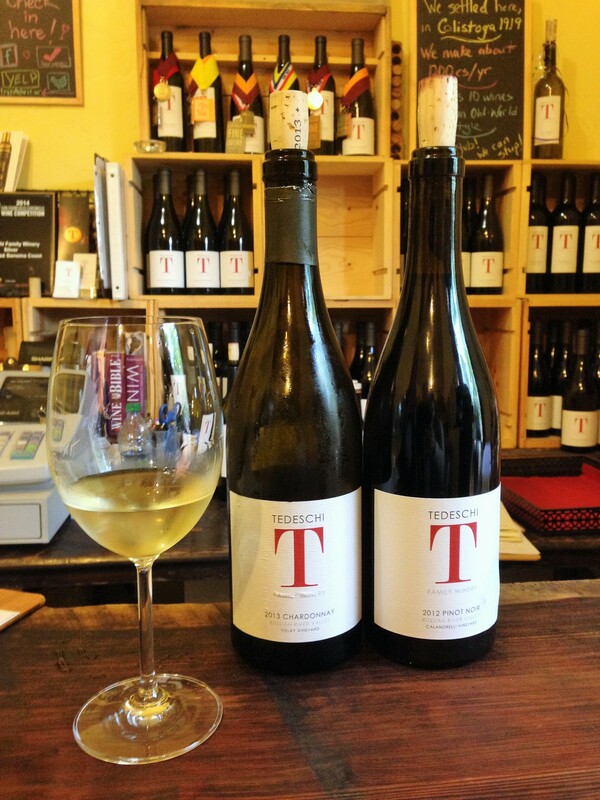 Tedeschi is a beautiful discovery and their wine club definitively worth a consideration if you live in the area, or at least the country. The winery only offers visits by appointment, unless you are lucky enough to drop by when there are other guests. We drive into Miravalle Estate, one of three properties part of the Spring Mountain Winery, and park by the gardens in front of a Versaillesque building with rounded roofs and blue ocean tiles. We could be anywhere in France but the accent of my co-wine lovers reminds me that we are, in fact, in California. 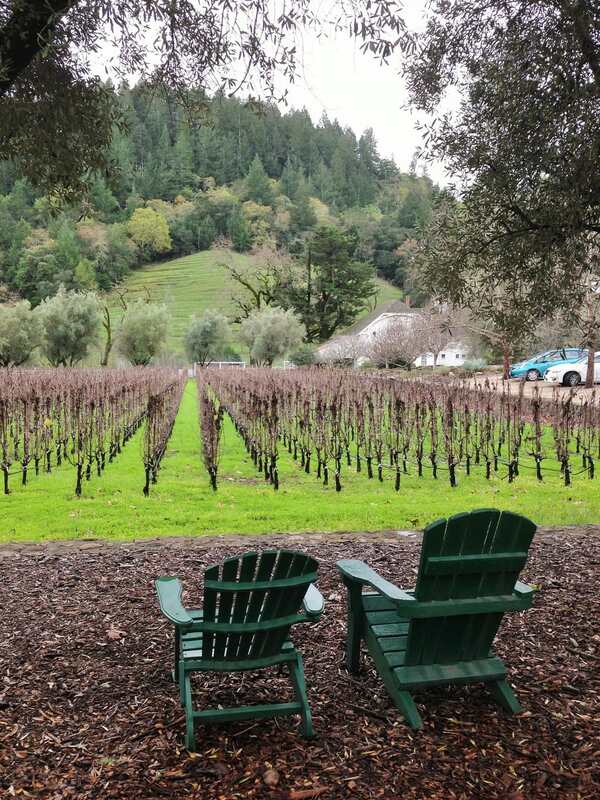 As a winery, Spring Mountain is known for its very old French heritage in the wine industry in Napa dating back to the end of the 19th century. You may have seen images of its famous terraced vineyards, each layer often as thin as a line of vines only, which make me think of the huge Banaue rice terraces in the Philippines or the familiar vineyards in the Priorat region in my home of Catalunya. 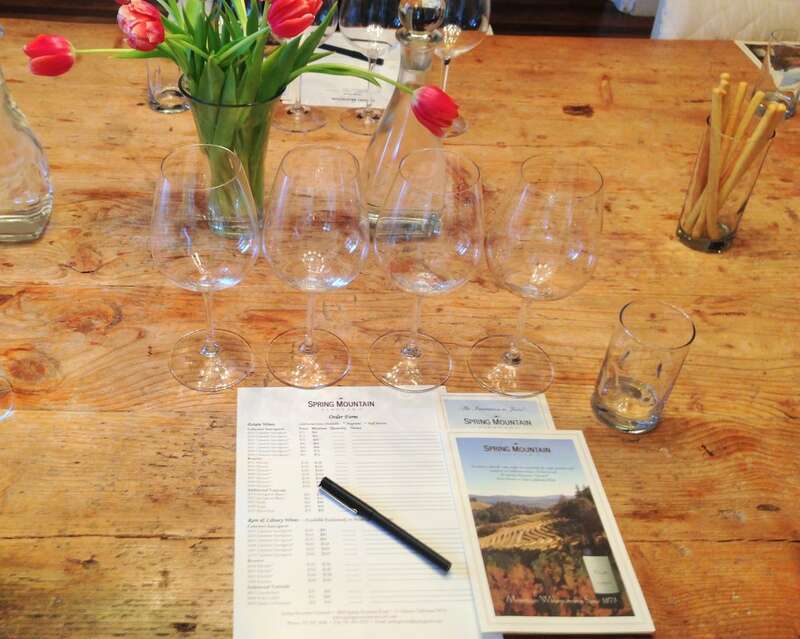 Most of the grapes grown and produced by Spring Mountain are of the traditional French varieties, Cabernet Sauvignon being the star, as is common in Napa. What makes Spring Mountain so unique is the fact that the vines are grown in separate blocks of land, hand picked and produced separately. It is at the time of blending that the winemaker decides the combinations of the 135 available separate wines. We are greeted by the wonderful Wine Educator, Ish, and a glass of cold and award-winning Chardonnay also a protagonist at the Paris tastings. Walking through the lush gardens on the gravel path towards the main mansion of Miravalle is a gift to the senses. The early afternoon on this wintery and rainy day is still chilly but we can’t help but wander around the property taking in the views and the surroundings. The property, appropriately named “Look valley”, provides stunning views over the Napa Valley from the grounds, the view is apparently breath-taking from the watch tower where the entire Napa Valleys is visible to the naked eye. The bushes, trees and flowers scattered across the property are beautiful and they must be an incredibly peaceful setting in the spring and summer months. The olive trees, which we are told are not always harvested, are decades old and their branches cascade down onto the ground. There are over 250 types of roses. 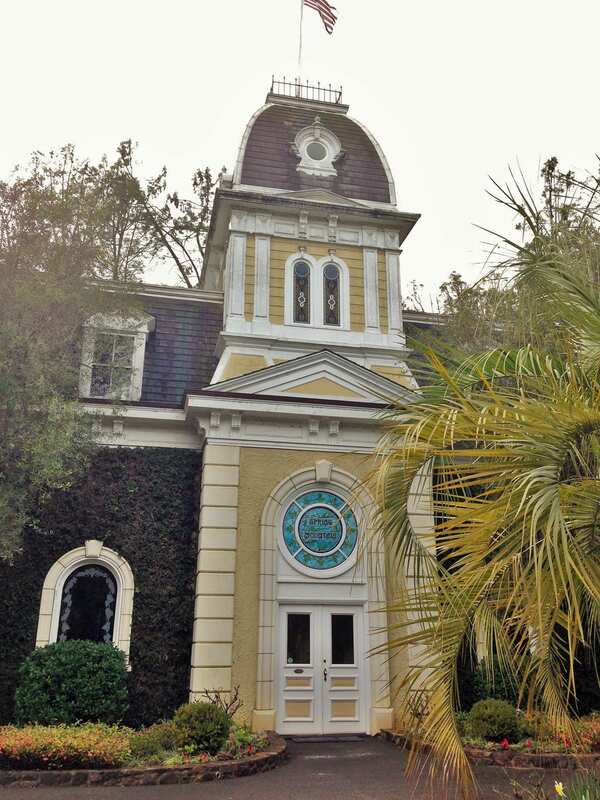 The winery was also made famous in the 80s because of its Victorian mansion, built in the late 1800s by the previous owner, notorious bachelor Tiburcio Parrott, and easily recognizable by TV buffs as the set of TV series Falcon Crest. Previously not accessible to visitors in order not to detract attention from the wine making, it is now used for wine tastings. It is a majestic and elegant building with original Tiffany’s painted glass and period furniture some of which the owners have yet to find out what its purpose was. Venturing inside is like stepping back in time. 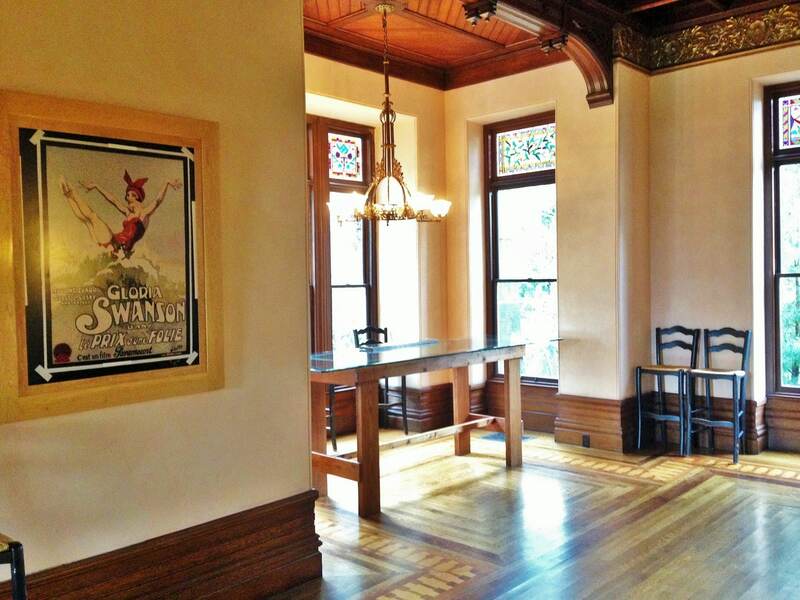 The creaking wooden floors and the large windows opening onto the gardens are gorgeous. The wooden staircase where the parrot, the founder’s symbol, used to stand is still there, fully renovated to its historical splendor. We make our way to the tasting room, a bright explosion of whites and light wood colors with a large bright chandelier and beautiful red tulip arrangements. This is one of the most beautiful laid out tastings that I have ever seen. The amount of detail and love that has been poured into making this special goes a long way to illustrate the passion for sharing Spring Mountain’s fantastic wines. After the white, we are offered 5 reds including their famous signature Elivette range, named after the most recent owner’s parents, Eli and Elisabeth. 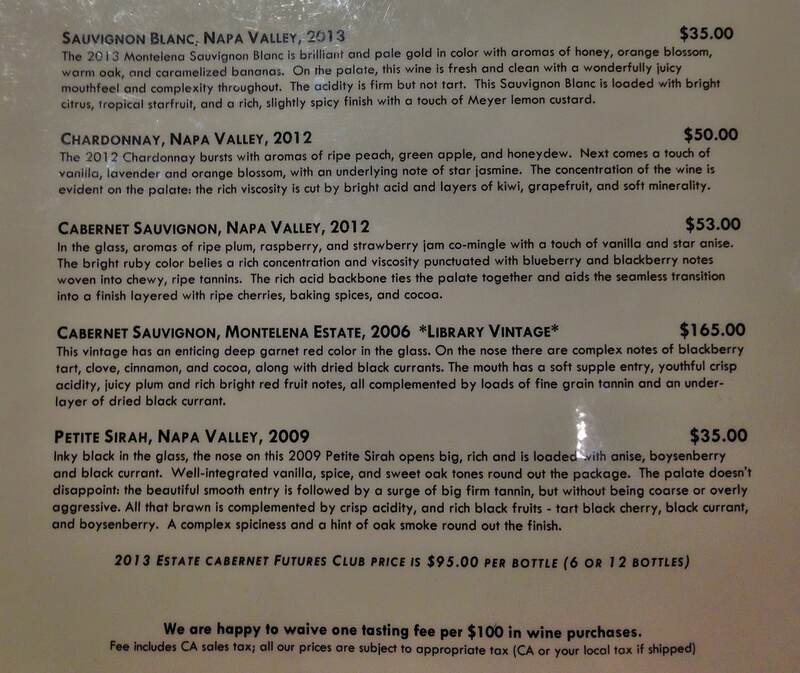 The 2003 Cabernet Sauvignon is my favorite, although I seem to be alone in that preference. Wine, after all, is a matter of taste and I always remember the wise words I have heard many times before: the best wine is the one you like. We have the pleasure of tasting three Elivette, the one from 2007, 2008 and 2009. All three years were great for wines in Napa and the wines are all fabulous and have the character of a fine Bordeaux blend. Although I am not a big fan of French wines, preferring to support countries with as important a tradition but worse at marketing than France, Elivette would convert even me to the method. What strikes me, as with previous wineries, is the very high alcoholic levels of Napa wines. In discussions with the rest of the very savvy wine drinkers in the room I find out that American consumers favor wines with high alcohol percentages. I struggle to drink these 14,5-15,3% wines which taste more like liquor to me. Nonetheless, the Elivette range merits mention for the delicate balancing of so many individually produced wines and the complexity of the wines. Although the range is focused mainly on a solid Cabernet Sauvignon base it is then complemented with Petit Verdot and Cabernet Franc. These are grown up wines, perfect for a special occasion or for a celebration. They are complex, elaborate and sophisticated and they are all fabulously mature. Above and beyond the wonderful wines what I found memorable of our visit to Spring Mountain was the care that went into the tasting. It showed that they are passionate about what they do and that it mattered to them. It also immediately made me feel like I was sitting at home in the Mediterranean sipping wine on a cold winter day. Looking through the windows, over the unused but perfectly taken care of swimming pool and onto the lines of vines was a lesson in attention to detail.